Earn $11.60 in Podium Club credit (1160 points)What's This? 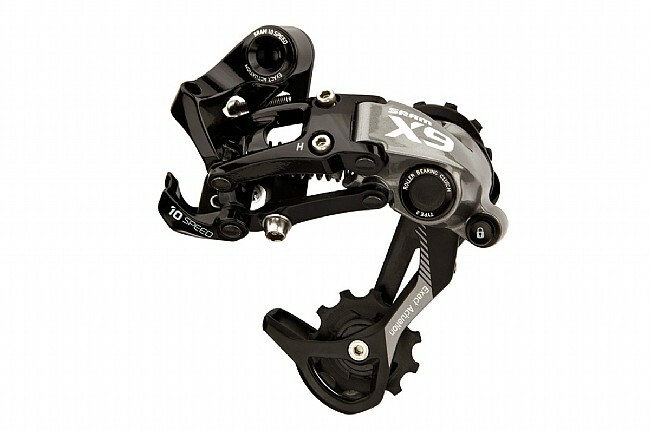 SRAM has perfected the balance of performance and affordability with the X9 Type 2 Rear Derailleur. This new "Type 2" model features a one-way roller clutch which eliminates derailleur bounce and chain slap. The integrated CageLock feature allows for speedy wheel changes. Elsewhere, SRAM's smart blend of materials includes a carbon fiber and aluminum outer cage, aluminum inner and outer parallelogram links, and stainless steel hardware. This fine-tuned combination offers durability and weight savings, all while maintaining a reasonable price. Needle bearing pivot points provide superior performance in messy conditions, and Exact Actuation technology ensures precise and dependable 10-speed indexing. Replaceable pulleys with sealed bushings keep out mud and debris. The SRAM X9 Type 2 Rear Derailleur is compatible with all current SRAM MTB and Road shifters. Available in Grey with a Medium or Long cage. 36T max. cog. Chain wrap: 35/47T (medium/long cage). Actual weight: 250/270g (medium/long cage).